Protec’s “Penny Wars” Fundraiser – Total Raised and Winner! The counts are in! 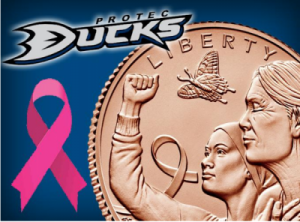 The winner of Protec Pond’s first “Penny Wars” fundraiser are the PEE WEES for cash total and the BANTAMS for the actual PENNY WARS game! CONGRATS TO BOTH ….pizza parties will be thrown in your BOTH your honor in our party room at a date TBA! Thank you to all who participated, it was a tremendous success. The total raised was – $379.65! A check has already been cut and donated to METAvivor, a most worthy cause that is dedicated to the specific fight of women and men living with stage 4 metastatic breast cancer. At the time of METAvivor’s founding, no organization was dedicated to funding research for the disease and no patient groups were speaking out about the dearth of stage 4 cancer research. While more and more people have taken up the cry for more stage 4 research, METAvivor remains the sole US organization dedicated to awarding annual stage 4 breast cancer research.